Elchemea Analytical is an easy to use free impedance fitting and plotting application. It is intended for users already familiar with impedance spectroscopy (EIS) and related techniques. Multiple standard impedance elements including discrete elements (L,R,C,H,Q) as well as diffusion based elements (W,O,Od,G,Gd,T,Td). Specialized combined impedance elements (parallel RC, RQ and RL). Possibility for creating custom complex impedance elements through series and/or parallel connections using container elements. Easy to use method for obtaining good start values for free parameters before fitting. Browser based (no client installation necessary). Publication quality graphics using Gnuplot(c). Impedance plots with fixed unity aspect ratio (a half circle IS a half circle). Multiple impedance plots on same graphics for easy comparison. Accepts multiple file formats including ZPlot(R) / ZView(tm) files. Elchemea Analytical was developed in order to make impedance fitting easier and more accessible as well as to be able to produce publication quality graphics. As most plotting applications by default use the whole plotting area for the available data, usually one ends up with a non unity aspect ratio (in which a half circle will look like an elipse for instance), it was important to address this as a non-unity aspect ratio in a graphical representation of impedance spectroscopy data may lead to wrong conclusions. 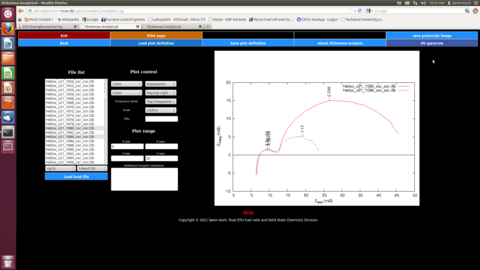 Screen shot of Elchemea Analytical in fitting mode. 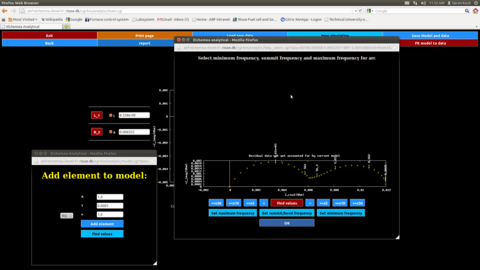 Screen shot of Elchemea Analytical in multiplot mode.